This hopper assembly is designed to mount on top of your existing material hopper, eliminating the sight glass for a cost savings. This hopper comes with one of four (4) tube mounting assemblies that mount the material sensor. 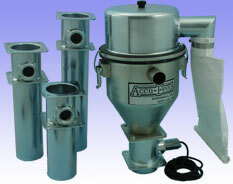 Standard sizes are 1” long extension tube for standard hoppers and 6”, 9” & 12” long extension tubes for drying hoppers. The extension length for the drying hoppers will keep the material below your air outlet tubes.